If you were on a fossil dig, and you happen to dig up the mandible (top picture), and the chopping stone tool (lower picture) which one would you say required the most intelligence for its form and construction? The incentive to exacerbate fossil finds, and to make outright fakes is immense. The incentive to be very honest about fossil finds is nil. Consequently, evolutionary biology becomes filled with faked and exacerbated fossils. Which ones are real? Which ones are complete fakes? Which ones are real but completely exacerbated? Once the fossils are successfully morphed into something they are not, once they are accepted universally in the world of evolutionary biology, and painted into many timelines and charts, they become real fossils, and real precursors to more modern species. Layer after layer of fossil fakes and exacerbations build up, as does the science that they support. The layers become so overwhelming, it becomes next to impossible to challenge any of them. Fossils that are proved to be fakes are still discussed as valid finds. Evo-illusionists will ignore the evidence of the fakes, and often continue on using them as proof of evolution. I recently watched a Nova documentary called “Becoming Human: Unearthing Our Earliest Ancestors”. The announcer described some rocks that were chipped in a particular way that made them seem like intelligent humans might have made them. Evolution says brains evolved slowly in our ape ancestors. They gradually increased in intelligence until they were able to make these stone tools. Supposedly these rocks were the first sign of intelligence in human precursors. The fact that these were chipped in a certain way so that they could be used for shaping and cutting proved the presence of intelligence in their design. Of course as time went on, our ancestors evolved more and more complex brains, with greater and greater intelligence, until we became intelligent enough to make cars, airplanes, and computers! I find this to be the most unbelievably perfect example of why evolution is anything but a real and objective science. Above left is a photo of the rock that Nova thinks is a great example of the beginnings of human intelligence: the stone tool. 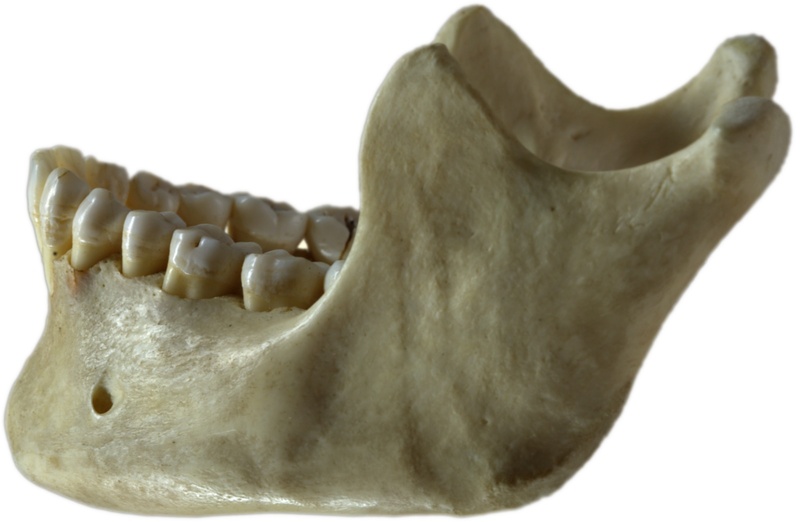 Above right is a human mandible; a lower jaw. It has two condyles designed like the balls of two ball and socket joints that fit perfectly into its human skull counterpart. Each condyle slides forward and back, independently, which makes the mandible a double sliding double ball and socket joint. It has teeth that are designed to mesh exactly with the teeth in the upper jaw. It has small linear cavities with openings for the nerves that innervate the teeth and lower face. The mandible is an ingenious tool, but the announcer and Nova would like you to believe there was not a lick of intelligence necessary to design it. But that chipped rock-tool? Oh boy, there was oodles of intelligence needed to design that rock-tool. In fact that rock-tool is proof of the beginning of the evolution of human intelligence. The jaw? Even though it is far more complex, far more useful, and seemingly obviously designed, no intelligence was needed or used to make it. Compare and contrast the two yourself. Which requires more intelligence for its manufacture? The answer is obvious. Is evolution honest science? The answer to this question is also obvious. Could anyone with a straight face look at the rock and say it was intelligently designed as declared by Nova, whilst looking at the mandible and say was is not? Yes, of course. All evo-devotees and evo-illusionists could. What are the possibilities when ancient pre-human fossils are dug up, and “tools” like the above rock is found nearby? (1) The rock “tools” could have been formulated by the digging crew, and placed nearby to make it look like the fossil find looks like it is for certain an early human. Things like this have been done numerous times by over eager fossil hunters who want to exacerbate their finds. Just think of how much more valuable a hominid fossil would be if tools were found nearby. The money incentive, and the fame incentive are overwhelming. (2) They are rocks that have been chipped by another set of modern humans who populated the area around the fossil find. Over hundreds of thousands of years, how can it be proved that the fossil was actually the source of the chipped rocks found “nearby”? I mean really. If two separate items were buried ten feet apart in any remote area, and left for 150,000 years, what would be the chance that today they would still be buried close together? 150,000 years is one hell of a long time, and so many events could occur during that time that would move or remove one or both items. 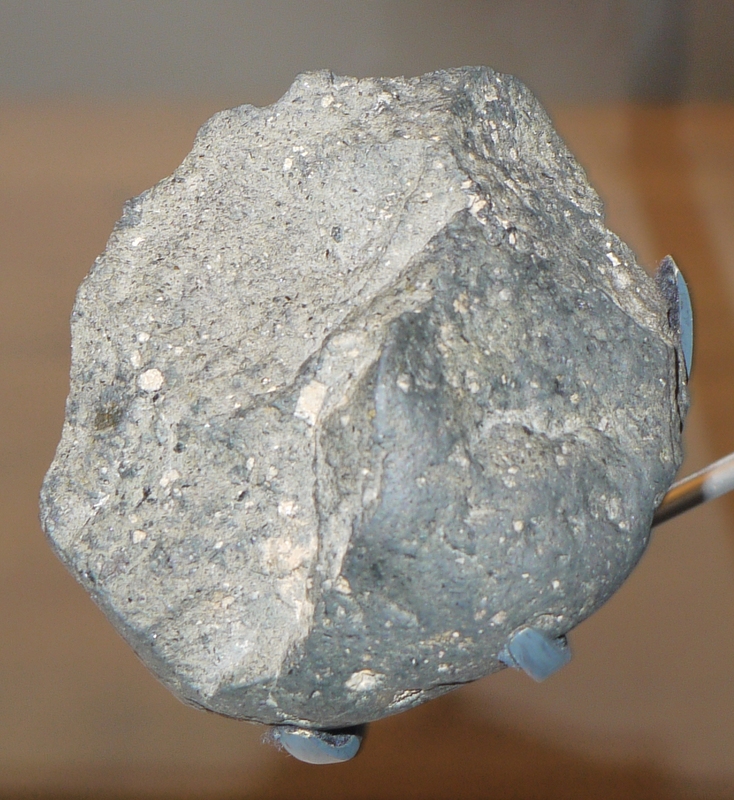 (3) They are not tools at all, but simply rocks that were chipped by events of nature that made them look like tools. After all, evo-illusionists think random happenstances could make humans. According to evo-illusionists who say selected random happenstance can make a human skeleton, random geological accidents could certainly make something as simple as a chipped rock that looks a bit like a tool. With the hundreds of thousands of years, and the number of rocks in the area of the find, anything can happen. Just ask any evo-illusionist or evo-devotee. Of 625 ape primate species on Earth, not one single one is capable of forming tools from rocks, even though they have had hundreds of thousands of years to evolve enough intelligence to make tools. No, ape intelligence of the 625 species of ape, has remained exactly static for millions of years, whilst the lineage of ape that became human developed incredible intelligence. Wouldn’t it be logical and expected that at least some of the 625 primate species would be developing intelligence so that they would be able to make tools? Why was only one of the 625 endowed with evolving intelligence, whilst every single other primate species is exactly equal in their ability to make tools: 100% cannot. Why did intelligence evolve several hundred thousand years ago in the lineage of one single primate, but no others? Where is the gradualness and randomness of evolution when it comes to tools and intelligence? Shouldn’t apes of all different intelligence levels be observed today if evolution were true and valid? That’s a great one. Know what they would answer? Of course “nature’s limb is bad design”. Open the comment section at the bottom. There is a guy calling himself PZ Myers, but I don’t know if it’s THE PZ Myers. Wouldn’t you love having bumblebee tongue measuring for your career? I wonder who pays these people. The demand must be huge. And, well, they’re still bumblebees. Man! Why is your last book not available on Kindle format?